Sometimes even the most diligently maintained vehicles run into problems. Preparing for unexpected emergencies will help alleviate anxiety in stressful situations and can help keep you safe. 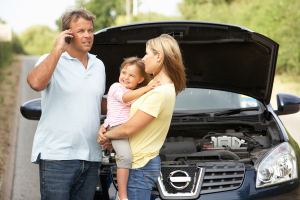 Here are some things you can do to prepare for potential car troubles. 1. First aid kit – Keep a first aid kit in your car at all times. Include items such as antiseptic wound cleanser, various sizes of adhesive bandages, gauze pads, medical tape, safety pins and scissors, tensor bandages, rubber gloves, burn care, aspirin, and any medications you may need. Prepared kits are also sold – be sure to familiarize yourself with the contents and replace any items you may use. 2. Blanket – With variant temperatures and four seasons, having a blanket in your vehicle year-round is a must. If you break down, a blanket can help to keep you warm without having to run your engine (which puts you at risk of carbon monoxide poisoning). A further precaution is to pack a thermal blanket will help contain your body heat. 4. Fire extinguisher – Keep as small multipurpose dry chemical fire extinguisher in your trunk – only to be used for small fires that have just ignited (wiring, oil leaks, etc). If your vehicle is on fire, it is safer to move away from the vehicle to a safe distance from the road and the car. 5. Flares – Flares can help to attract attention, identify your location to roadside assistance operators, and warn other drivers of the location of your vehicle – particularly in poor visibility conditions. 6. Flashlight – A waterproof flashlight (in case of inclement weather) can help you see and be seen in the dark. 7. Food and water – Non-perishable foods such as granola or energy bars and drinking water in case you have to wait for assistance. 8. 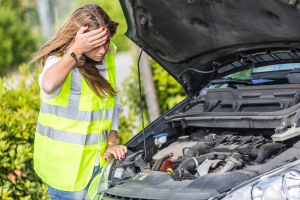 Jumper cables – Jumper cables can help you start your car if you’re experiencing trouble with your battery or charging system. If you are unsure how to use them, call for roadside assistance. 9. List of phone numbers – Keep a list of emergency phone numbers in your kit. 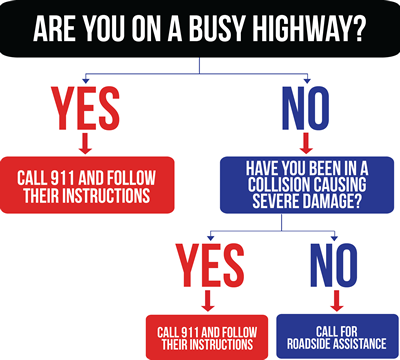 Include phone numbers for friends, family and roadside assistance. 10. Paper map – Yes, paper! A GPS isn’t going to help you if you don’t have power or have a weak signal. 11. Reflective warning triangles and vest – Ensure you have at least three triangles. Many prepared emergency kits contain one warning triangle, however it is better to have three that you can place 15 metres apart to warn oncoming traffic. Put on your vest for visibility. Don’t place the triangles if it puts you at risk of being hit by oncoming traffic. 12. Comfortable shoes and socks – Comfortable shoes are a must for changing tires, walking for assistance and even warmth. 13. Umbrella/waterproof jacket – Keep waterproof gear in your car in case you have to exit your car in the rain so you stay warm and dry. 14. Whistle – A whistle can help you attract attention if you’re in trouble. 15. Winter: Add the following items to your emergency kit: a candle in a deep can and matches for light and warmth, road salt and/or kitty litter, a small shovel, a snow brush or ice scraper, extra windshield washer fluid. If you cannot pull off the road, do not risk injury by attempting to push your car off to the side; simply turn on your hazard lights. If you are on a busy road and are concerned about being hit from behind, leave your car as soon as you can without risk and move to safe spot. It’s important to make your car visible so that other drivers, roadside assistance operators and/or emergency crews can see you. Turn on your hazard lights and use flares if necessary. In poor weather conditions, you can also tie a brightly coloured item to your antenna or door handle to improve your visibility. Put on your reflective safety vest, and place the reflective triangles in your safety kit 15 metres apart but only if it is safe from oncoming traffic to do so. Note: Regulations governing the use of hazard light vary by province and territory. Be sure to know your province’s rules on four-way flashers. Tell someone where you are. Call a family member or friend to tell them where you are, what the problem is, and how long you expect to be there. Be careful who you trust – if you choose to rely on a fellow motorist, ask him/her for identification and tell someone who they are, where you are going with them, and when how long you expect to be away. Diligently maintaining your vehicle can help you prevent car troubles and break downs, but it’s always good to be prepared for the worst. With your new well-packed emergency tool kit on board, your roadside assistance as insurance and your new know-how, you’re ready to hit the roads and are prepared for any bumps along the way!